First of all my apologies for lack of updates. There have been a number of difficult problems to solve most of which have been extremely dull but necessary to overcome. I shan't bore you with too much technical detail. Suffice to say that working with technology not usually associated with guitar pickups has thrown up its own set of problems. These have largely revolved around quality, reliability, functionality, repairability and size. However I'm pleased to say that we have navigated a way though and the latest iterations are proving extremely positive. Let's look at some of the prototype boards. The switches and coils are all on one board, known as a rigid-flex PCB. This sort of technology is more often found inside DSLR cameras and smart phones than guitar pickups. This arrangement came with some issues. One that was of particular concern, in simple terms, was the thickness of the signal carrying tracks within the circuit board. There is a complex weave of wires inside that green sandwich and it was a tricky balancing act to for the cabling to work as it should, whilst being contained within such a small space. Now for the major design change update. We have decided to divide the board in two. One board for coils; one for switches. 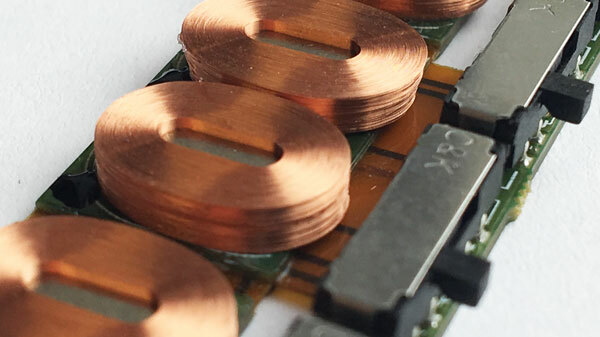 The modular approach has advantages in that during manufacture if there was a fault with one of the coils, the whole assembly would have to be thrown out. With this new approach, wastage is far lower. It also means that, should it be necessary, repairs are possible. With the original Submarine it was nigh on impossible to replace a faulty switch or faulty coil without destroying the rest of the innards. This aspect did not please me at all. This slightly more modular design solves that problem. After many trials and tribulations in balancing tone, signal to noise ratio, reliability, size and cost we think we've come up with the best design solution. For those of you hoping for a full hexaphonic breakout system in the future, I'm happy to report that this idea is alive and well. More info soon. So, "when do I get my hands on mine?" I hear you ask. As you have probably guessed we are behind schedule. Only once we have finalised the design of the PCBs can we push go for the manufacture all the other parts. We are now looking at a September shipping date. I'm so sorry that it has taken so much more time than originally anticipated. I know many of you have gigs, tours and recording projects that you were hoping to use the Submarine with. I can only apologise - I hope that I haven't put you in too tricky a situation. If you really are up s*** creek without a paddle please let me know and we'll work out a solution together. Thank you for your patience. I really appreciate your support!